Abids is a major commercial hub of the city of Hyderabad, India. It is the oldest and famous business area which developed after the development of Old City and Secunderabad. Major number of government buildings are located in this area. For example, the state government building APSFC, and President Plaza etc. This place has a mixture of Anglican Architecture, Persian Architecture and the modern Architectural style. This place has heritage structures which have been preserved from the past 200 years. The city of Hyderabad was not much developed. The two hotspots of the city were Secunderbad and Old City. Secunderabad is the twin city of Hyderabad. Old City and Secunderabad were the only areas where businesses were set up and gradually got overcrowded. After 1908 floods in Hyderabad, King Koti Developed. The Nizamshahis went shopping in the horse carriages to Abids. The area had a shop belonging to Albert Abid, a Jewish valet of Nizam VI of Hyderabad state, hence the area came to be known as Abid shop and the main road abutting the shop was known as Abid road. Later on, this area became popular as Abids. But this was just a small stretch which developed. During British rule in India in the year 1844 AD, St. George’s Church was constructed. Along with it came Grammar School for boys. This gave a boost to the construction of new schools in Abids. This area has many schools and educational institutions. The development of schools and educational institutions gave rise to the development of commercial activity related to the necessities of the School going children. 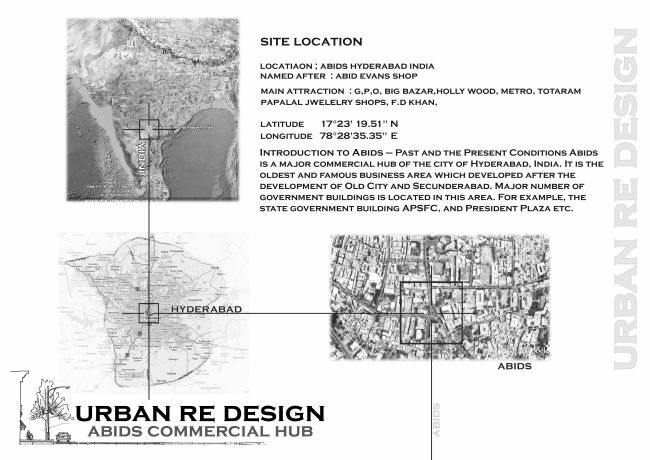 The commercial hub in Hyderabad selected for Redesign and Restructuring is “Abids” which was popularly known as the “Commercial District of Hyderabad”. Various issues regarding the Urban structure has been addressed. It includes commercial spots, residential communities, Amenities, Utilities, religious structures etc. The influence of each on the commercial activities has been addressed in the case study. 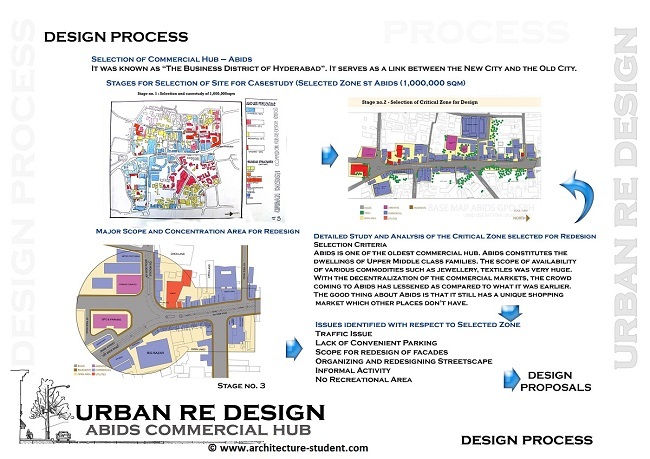 The design process for the design of commercial neighbourhood has been discussed in one of our previous articles. This will help you give you an insight of the design process in Urban Design. The issues include various Urban Design factors to be reconsidered for restructuring and redesign that will help revive the ambience of the Commercial hub which existed 50 years ago. The project “Design of Commercial Neighbourhood” needs critical study of area selected for redesign. 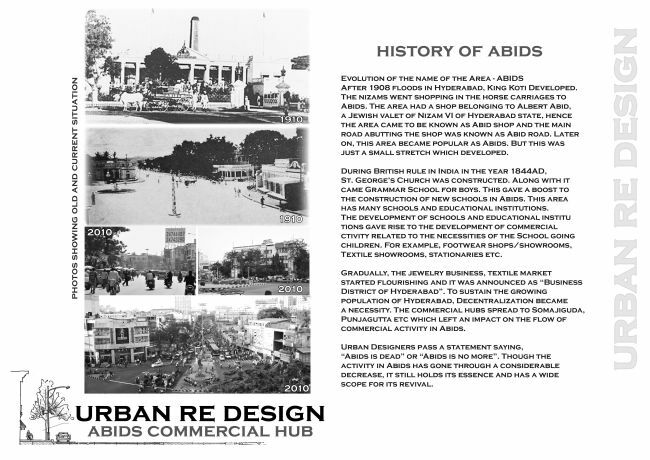 Abids has been chosen as the commercial hub for the Urban Design Project.